This simple sewing project will develop skills of pattern cutting and stitching. Any stitch can be used, but a whipping or blanket stitch work well. 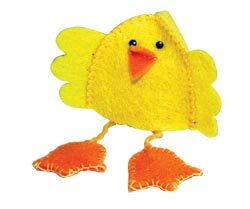 For a simpler activity, glue the beak, feet and wings in place and just stitch the main body. Alternatively, add a base and leave an opening in the back seam to fill with mini eggs. You will need: yellow and orange felt; black fun foam; white pen; yellow cord; yellow cotton; needle and scissors.